Practice makes perfect, but not all repetitions are equal. Although more than one-century behavioral and computational research has revealed many manipulations during studies that could lead to more effective learning, the exact cognitive and neural mechanisms are still under hot debate. These debates focus on one fundamental question in learning and memory, that is, how does repeated practice enhance memory, and how spacing could help to enhance these mechanisms further. Using functional MRI and a novel representation similarity analysis, our recent work has provided neural evidence to suggest that successful encoding of episodic memory occurs when the same neural representations are more precisely reactivated across study episodes, rather than when patterns of activation are more variable across time. We further found that brain stimulation and behavioral manipulations such spacing and variable encoding that could enhance episodic memory, are associated with greater pattern similarity across repetitions. Together, our result challenges the encoding variability hypothesis and lead to a neural activation pattern reinstatement hypothesis of the practice effect in learning and memory. 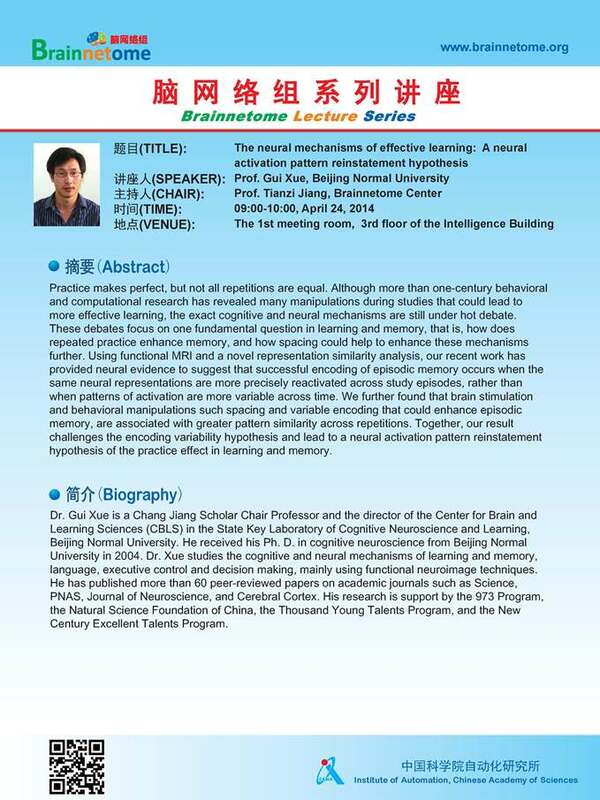 Dr. Gui Xue is a Chang Jiang Scholar Chair Professor and the director of the Center for Brain and Learning Sciences (CBLS) in the State Key Laboratory of Cognitive Neuroscience and Learning, Beijing Normal University. He received his Ph. D. in cognitive neuroscience from Beijing Normal University in 2004. Dr. Xue studies the cognitive and neural mechanisms of learning and memory, language, executive control and decision making, mainly using functional neuroimage techniques. He has published more than 60 peer-reviewed papers on academic journals such as Science, PNAS, Journal of Neuroscience, and Cerebral Cortex. His research is support by the 973 Program, the Natural Science Foundation of China, the Thousand Young Talents Program, and the New Century Excellent Talents Program.